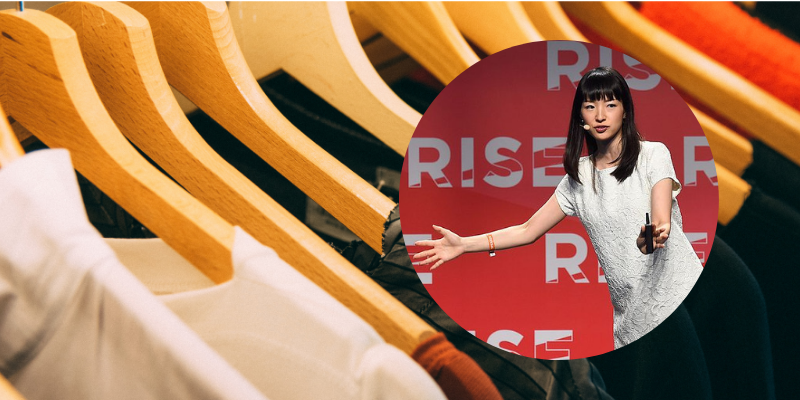 Marie Kondo’s ‘Tidying Up’ Netflix show and brand is built on decluttering, and after the holiday season who doesn’t feel the desire to purge, but is that the most sustainable way to approach excess, or should we change our tactic entirely? Taking an item from your home in your hand, Kondo would want you to decide if the piece brings you joy or anxiety, leaving you to get rid of those that cause the latter. Right now, thanks to Tidying Up’s popularity, people are pillaging their wardrobes and sending their not-so-gently-worn apparel and accessories to the nearest thrift shops, which these stores can’t sell. Where will these discarded pieces go? Landfills, friends. Landfills. Back then, having a capsule wardrobe meant owning a certain number of clothing pieces, usually around 30, that can be mixed and matched. However, the definition of a capsule wardrobe has evolved since then, as the prescribed number of clothing pieces has become less strict. Some women have even built many capsule wardrobes, each intended for a specific season. While such a move defeats the original idea of a capsule wardrobe (we like the up-to 30 pieces idea, thanks), it still goes by the principle of having all the basics covered. For us, it’s not about pulling out the pitchforks and shoveling out what you own, but, instead, being conscientious about what you buy next. • For your health: Hey, if Marie Kondo’s tidying has taught us anything it’s that decluttering isn’t just about appearance but also psychology. You may not find inner peace (wouldn’t that be nice? ), but owning a capsule wardrobe eliminates the stresses of having too many clothes and the pressure never to repeat outfits. Tasks that may sometimes seem overwhelming, such as organizing your closet or packing clothes for travel, are also made more manageable and less time-consuming. • For the environment: It’s no secret that fashion is one of the worst industries when it comes to pollution. The UN reports that the fashion industry accounts for a sizeable 10% of global carbon emissions and 20% of global wastewater. A small wardrobe is designed to help you keep the same clothes for a more extended period, thus preventing you from impulsively shopping for new items you don’t need. Therefore, this practice can help protect the environment and reduce the number of discarded fabrics. • For your savings: Part of the charm of a capsule wardrobe is that it teaches discipline when it comes to finances. When you stick to a fixed number of clothing items, you are no longer easily swayed by sales or new store arrivals, and when it’s actually time to get new clothes, you know what article to purchase. Making the big step towards creating a capsule wardrobe entails an inevitable change in the way you look at fashion. For one, less stress about your outfits opens up more opportunities for you to focus on experiences and life investments. Additionally, you get to realize that it’s okay to wear the same clothes over and over, and if you’re unsure, just take a page from former Huffington Post editor-in-chief Arianna Huffington, celebrities like Keira Knightley and Kirsten Dunst, or royalty like Kate Middleton. All in all, there are no set rules for what types of clothes to have in your 30-piece wardrobe. It’s all up to you and what you feel comfortable wearing repeatedly. That said, it’s a good idea to have a good set of basics—a t-shirt, a pair of great-fitting jeans, and cardigans or blazers to keep you warm. A little black dress and button-down shirts are also good investments, as these classic pieces can be used for long periods. When picking out clothes, it’s important to not only look at styles and colors, but also the quality of an item. Part of sticking to a smaller wardrobe is a commitment to prioritizing quality clothing, even if the piece may be a bit expensive. Still, the notion that high-quality clothes are only for the rich is one debunked by us here at Good Cloth. Someone who is conscious about sustainability will learn to look for durable wardrobe pieces, whether it’s at a high-end store or a thrift shop. It’s also encouraging that there are clothing brands entirely designed to promote long-lasting enjoyment of your wardrobe. Labels like Vetta Capsule, Hope Made in the World, and, of course, retailers like yours truly all offer quality basics that are undeniably stylish. Transforming your closet is never a smooth transition because it involves drastic changes in style and shopping habits. However, you’ll quickly find that the results are well worth the effort for you and the environment. Alissa Mel is a 25-year-old freelance fashion writer and minimalist enthusiast. Her favorite item in her closet is her plain white tee because it looks good with anything. She firmly believes that one can be both fashionable and eco-conscious.